In a context where the attraction and retention of talent is an issue, it is crucial for companies to hone their management style. Based on concrete examples, Annie takes stock of new trends in mobilization and retention, suggesting simple strategies to help retain employees and win new ones. Passionate about supporting leaders and their teams towards success, Annie Gingras offers her clients innovative management tools and approaches that ensure the integration of change, the execution of business strategies and the commitment of employees. A dynamic speaker, she shares practical tips and tricks and her best strategies for energizing teams, boosting the employees’ sense of belonging and commitment. Tabono ‘s mission is to simplify the organizational challenges of companies by offering them consulting services related to human resources management, change management, training and coaching.hing. Cost : members – 20 $ +tx | non-members $ 30 +tx. New flavors of local beers. What better way to celebrate the arrival of spring than all these novelties? 22may8:00 am5:00 pmA job in QuebecOrganized by the CCB-M, the Brome-Misssiquoi RCM, FCCQ and Revenu Québec. Live Up to your ambitions! Become a member to boost your exposure, enjoy many discounts, upgrade your skills and expand your network. Our newsletter is sent regularly and contains information regarding our upcoming events, CCB-M news and relevant information dedicated to help our members shine up to their ambitions. Is local purchase a value you hold dear? Purchase our CCB-M dollars to reward your staff, customers or partners, or become a participating merchant who accepts CCB-M dollars. Our member directory is a great reference for any complementary service you may be looking for on the Brome-Missisquoi territory; your ideal partnerships might only be a click away! The Chamber of commerce is also a SAAQ agent office that offers its services to the community of Cowansville and its nearest satellite towns. 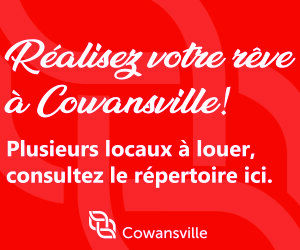 The office is located at 104, du Sud Street, suite 150, in Cowansville. You have a business and are looking for an office space or any other kind of premise in Cowansville? Are you a commercial building owner with an empty premise for rent? 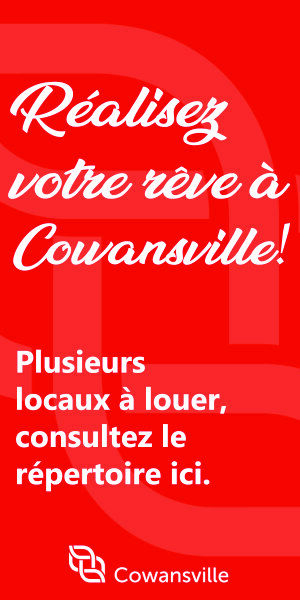 Click here to discover the vacant premises’ directory in Cowansville! Monday to Thursday: 9 a.m. to 4:30 p.m.